Garland suspended sets used in applications like mining for the conveying of large lump size material. 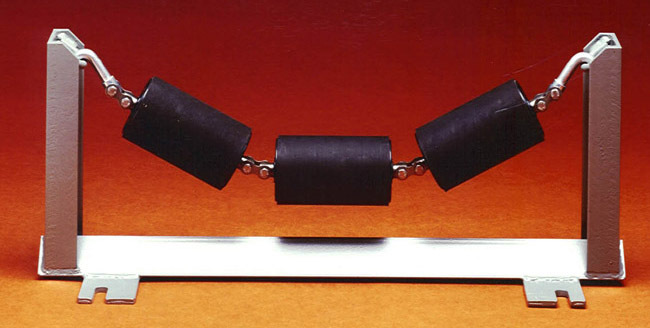 conveyor that couple robust strength with working flexibility, resulting in even higher belt speeds. In particular, research into solutions for the most critical area of the conveyor, that of the loading zone, has resulted in the RULMECA development of the suspended “garland” troughing sets. These suspended sets are quickly and simply installed, and allow maintenance to be performed on them without shutting down the plant. For these reasons, the “garland” suspended system has been the subject of substantial research and development, resulting in their increasing use in the most diverse applications.